Listen to His Holiness the Dalai Lama recite The Heart Sutra in Tibetan. My favorite contemporary version of The Heart Sutra is by Gary Azukx Dyson. Totally rocks! Try this acid jazz rendition of the Heart Sutra too. Shaolin Monk Shifu Shi Yan Ming recites the Heart Sutra at the end of the song Life Changes by the Wu-Tang Clan. The outro of the b-side song Ghetto Defendant by The Clash features the Heart Sutra, recited by Allen Ginsberg. A slightly edited version, Shiki soku ze kuu, is rumored to be Yoshimitsu’s theme in the PS2 game Tekken Tag Tournament. This page is dedicated to my little pal Rex. Thus have I heard. Once the Blessed One was dwelling in Rajagriha at Vulture Peak mountain, together with a great gathering of the sangha of monks and a great gathering of the sangha of bodhisattvas. At that time the Blessed One entered the samadhi that expresses the dharma called profound illumination,; and at the same time noble Avalokiteshvara, the bodhisattva mahasattva, while practicing the profound prajnaparamita, saw in this way: he saw the five skandhas to be empty of nature. 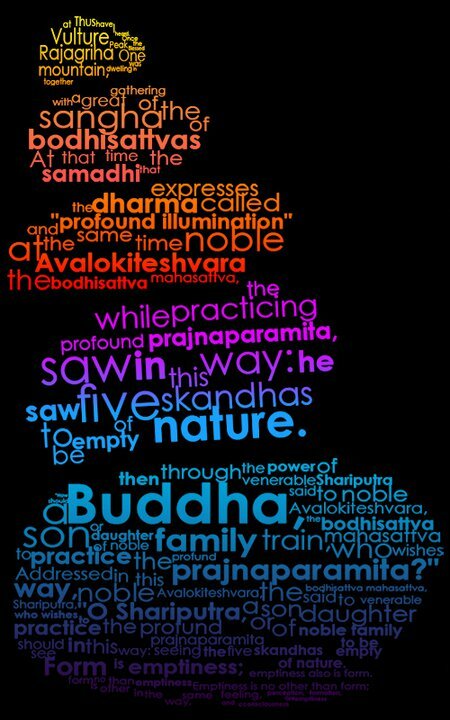 Then, through the power of the Buddha, venerable Shariputra said to noble Avalokiteshvara, the bodhisattva mahasattva, How should a son or daughter of noble family train, who wishes to practice the profound prajnaparamita? Addressed in this way, noble Avalokiteshvara, the bodhisattva mahasattva, said to venerable Shariputra, O Shariputra, a son or daughter of noble family who wishes to practice the profound prajnaparamita should see in this way: seeing the five skandhas to be empty of nature. Form is emptiness; emptiness also is form. Emptiness is no other than form; form is no other than emptiness. In the same way, feeling, perception, formation, and consciousness are emptiness. Thus, Shariputra, all dharmas are emptiness. There are no characteristics. There is no birth and no cessation. There is no impurity and no purity. There is no decrease and no increase. Therefore, Shariputra, in emptiness, there is no form, no feeling, no perception, no formation, no consciousness; no eye, no ear, no nose, no tongue, no body, no mind; no appearance, no sound, no smell, no taste, no touch, no dharmas, no eye dhatu up to no mind dhatu, no dhatu of dharmas, no mind consciousness dhatu; no ignorance, no end of ignorance up to no old age and death, no end of old age and death; no suffering, no origin of suffering, no cessation of suffering, no path, no wisdom, no attainment, and no non-attainment. Therefore, Shariputra, since the bodhisattvas have no attainment, they abide by means of prajnaparamita. Then the Blessed One arose from that samadhi and praised noble Avalokiteshvara, the bodhisattva mahasattva, saying, Good, good, O son of noble family; thus it is, O son of noble family, thus it is. One should practice the profound prajnaparamita just as you have taught and all the tathagatas will rejoice.